My first triathlon season, the summer of 2011, included two other Sprint distance events: SheRox and TRI for the Cure as well as the bike leg of a long course event called Harvest Moon. 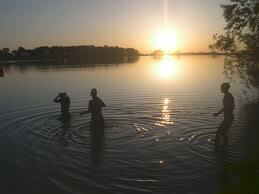 The swim portion of SheRox and TRI for the Cure both include ½ mile of open water swimming. This introduced a new, and unfamiliar, element to my triathlon training and racing. By this point, I was becoming increasingly comfortable with my reconnection with swimming, in a pool. Lane ropes, chlorine, 25 yards/meters with nicely defined markings on the bottom and clear water so you can see where you’re going. I could do that. Open water swimming, was not in my wheelhouse (yet). Open water swimming also introduced the need (or want) of another expenditure, a wetsuit. I’ve heard stats that wearing a wetsuit makes you 10% faster. Perfect, I’ll take that, but more importantly it allows you not to get hypothermia while swimming in a lake. Of course, you can find a wetsuit at various prices. Last year’s model, rental suit sales and formerly owned suits are all an option. 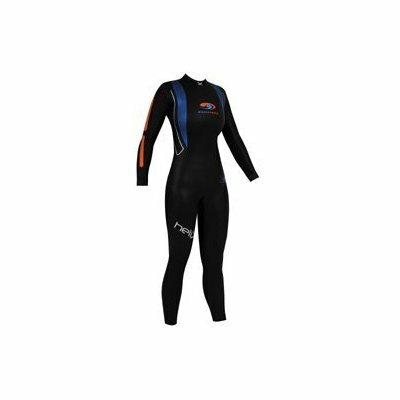 There are also different levels of wetsuits available which also directly influence the price point. I did my research, discussed with my coach and spoke to #1 guy (Keith). The question was how many wetsuits do I expect to purchase? The answer was, ONE. Guy #1 then said get what you think is the best…Thank You, I was sold! The suit I wanted was a BlueSeventy http://blueseventy.com/ Helix. The Helix was flexible, fast, cool looking and…expensive. It seemed, based upon my “in-depth” (not really) research that real swimmers wore BlueSeventy more than the other brands. Cha-ching, hear that sound? It’s the cash register ringing up with the purchase of one BlueSeventy Helix wetsuit. Done! Getting familiar with the technique of swimming and racing in a lake (maybe in the future even in the ocean) was something I need to wrap my head around. I signed up for an open water swim clinic lead by Melissa Mantak, 2010 USAT National Coach of the Year held at Grant Lake in Littleton, Colorado. It was absolutely time and money well spent. She talked about a whole gamut of helpful topics including: how to put on the wetsuit, taking off the wetsuit quickly in T1, the importance of sighting while swimming so you don’t go off course, where to position yourself in a wave start and much more. Then we got in the water and swam a half mile course. This clinic immediately allowed me to improve my confidence with open water swimming and feel much more comfortable with the idea of racing in a wetsuit. I, or rather Cary, then added open water training to training calendar. This entry was posted in It's NOT the Destination...It's the Journey and tagged blueseventy, open water, Open water swimming, triathlon, wetsuit. Bookmark the permalink.